XIV, 334 p., 14,8 x 20,5 cm. 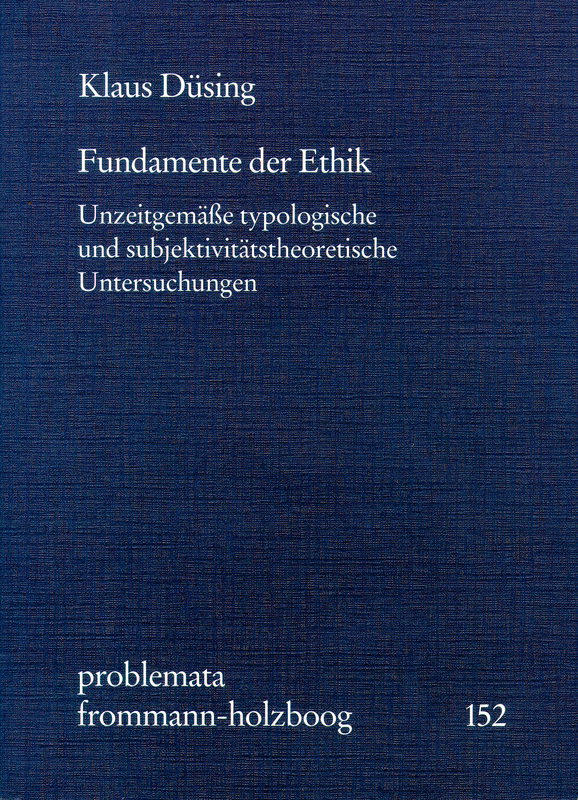 In the plurality and the complexity of the numerous approaches to ethics, Düsing has created order with his classification of the basic types of ethics in the past and in the present. Based on his theory of models of self-consciousness, the author develops a structure of ethical principles in which he outlines an ideal ethical community of self-determining persons only. In studying the latest approaches to ethics, he shows how the basic areas of implementation for ethics have been influenced by this concept and provides suggestions for solving application problems. Contemporary debates on ethics are mainly concerned with concrete problems of application, the principles of which are often controversial, because unquestioned. Therefore, in this book the discussion of principles of ethics shall be revived, and it shall be explained an own systematic solution. The manifold of traditional as well as contemporary conceptions of ethics is systematically organized by distinguishing specific fundamental types of ethics. On that basis, and proceeding both from my theory of models of self-consciousness and a critical examination of new and most recent conceptions of ethics, a structure of ethical principles is put forward, namely an ideal ethical community, which is conceived by pure self-determining persons. It is shown how this structure of principles can be realized in fundamental areas of ethics, i.e. in duties, virtues and goods or purposes, also in individual and political ethics, and how a theory of subjectivity can provide its new foundation. On such a basis, special ethical problems of application can be brought closer to a clarification. Düsings Buch ist für den Fachphilosophen von heute eine hervorragende und überzeugend disziplinierende Herausforderung. Für den philosophisch bewanderten Laien sogar ist es lesbar und kann ebenfalls in vielen Passagen zum Genuss werden. [...] Das ist bei fachphilosophischen Büchern von heute keine Selbstverständlichkeit.